If you go down to our woods today… As I’ve previously mentioned, my main reference for a permaculture approach to managing our woods is Ben Law’s The Woodland Way: A Permaculture Approach to Sustainable Woodland Management and my course notes from his introduction to permaculture and assessing a woodland course that I did a couple of years ago. As I understand it, there is “high forest management”, where trees are grown over a long time frame, selecting the best quality trees and selectively and successively thinning the rest, and “coppice rotation”, which might be cutting a crop of ash or hazel poles every seven years or so, or a combination of the two, giving say, hazel coppice grown under oak standards. Our woods were planted up about 24 years ago by the previous owner as a plantation of pine, maple, wild cherry and American red oak. There are several other, older trees: some yews, for example, traditionally planted in churchyards, associated with the seventeenth-century presbytery, which marks the entrance to the wood. There are some old beech which mark out the original field divisions when it used to be just pasture. There are also many self-seeded ash, a wonderfully versatile wood and ideal for coppice rotation. No management is evident since planting and it is high time that some thinning was done. Monsieur Girard, the expert forestier has advised me on the strategy to achieve this and will come back to the wood to spend half a day helping me choose suitable trees to save and a timeframe to thin the others. No access routes—rides—had been planned for, so removal of large section timber will be a problem. 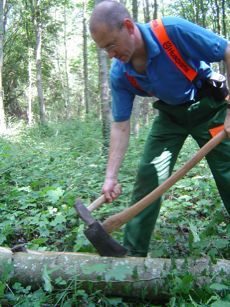 Coppicing is ideal if access is restricted as poles can be carried out by shoulder. I would like to convert sections of the wood into coppice, using existing ash and planting more to get the spacings correct. By the second cut, I’ll be 59 and, hopefully still fit enough to cut and carry out such a harvest. There may be a problem here, as Monsieur Girard explained: if the original owner had a state subsidy to plant, it could place restrictions on how the wood is managed. I’ll know more after I’ve had a meeting with the Directions Départementales de l'Agriculture et de la Forêt. Whatever the restrictions, there will be a sustainable permaculture approach to manage this woodland.